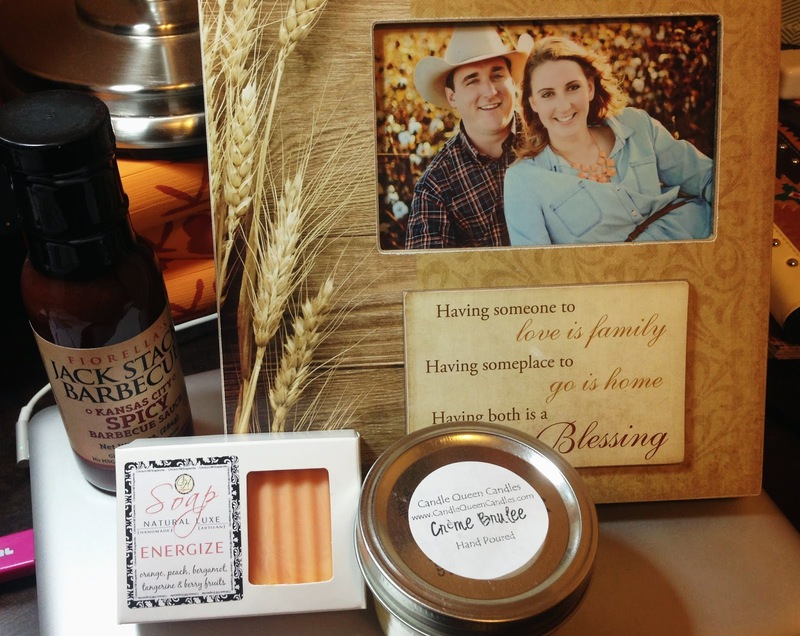 Back in November (you know, back when I actually remembered I had a blog), I joined up with over 60 ladies in agriculture for the "Christmas in the Country" gift exchange. Let's say this - I actually completed this blogging challenge (cue references to the only 23 posts of the 30 days of agriculture)! Hosted by the wonderful ladies of Country LINKed, This Uncharted Rhoade, Diaries from the Dirt Road, and The Ranch Wife Chronicles, this blind gift exchange was so much fun! I was given another blogger's name to send our gift to, and then another random blogger was chosen to give a gift to me. Our gifts could include a variety of things, but we were encouraged to include gifts from our home areas. Katie Pinke from The Pinke Post was the recipient of my Texas gift bundle, which included a bunch of random food made in Texas and also a couple of cotton bolls. Katie sure seemed to put my Texas gifts to good use, and I had so much fun thinking of stuff to put in it! "The BBQ sauce is our favorite from Kansas city" - And yes, it is delicious! I just love Jack Stack Barbecue! "The soap and candle are handmade in Leavenworth" - The soap, made by Crimson Hill Soapworks, smells delightful! I don't want to use it because it is currently providing wonderful smells in my office. And the Crème Brulee candle, made by Candle Queen Candles, makes me want to eat it... which I have managed to restrain myself from thus far. "The picture frame is just something that caught my eye at a local shop." - Let me tell you, Jennifer, you've got a great eye! I absolutely love it! It seriously couldn't be more perfect! I mean it has wheat on it! Thank you, Jennifer, for the thoughtful gifts! A big thank you to the Christmas in the Country hosts as well. Y'all did a wonderful job organizing this awesome event! I can't wait to participate next year.